Rewilding Europe Capital is Europe’s first rewilding enterprise funding facility that provides development loans and business support to new and existing businesses that look for opportunities created by the emerging rewilding movement across Europe. 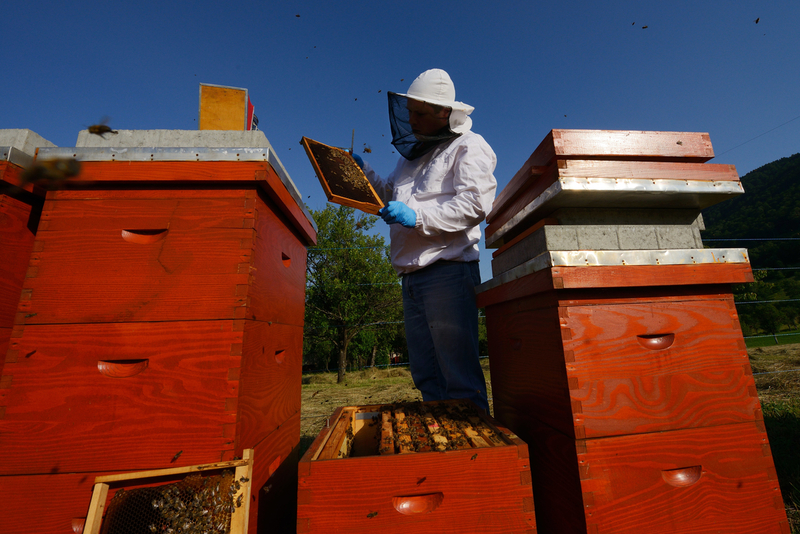 In its first stage, covering less than two years, REC supported 16 enterprises in four different countries (Portugal, Italy, Croatia and Romania) creating over 30 new jobs and enhancing the rewilding of 20,000 ha of land. 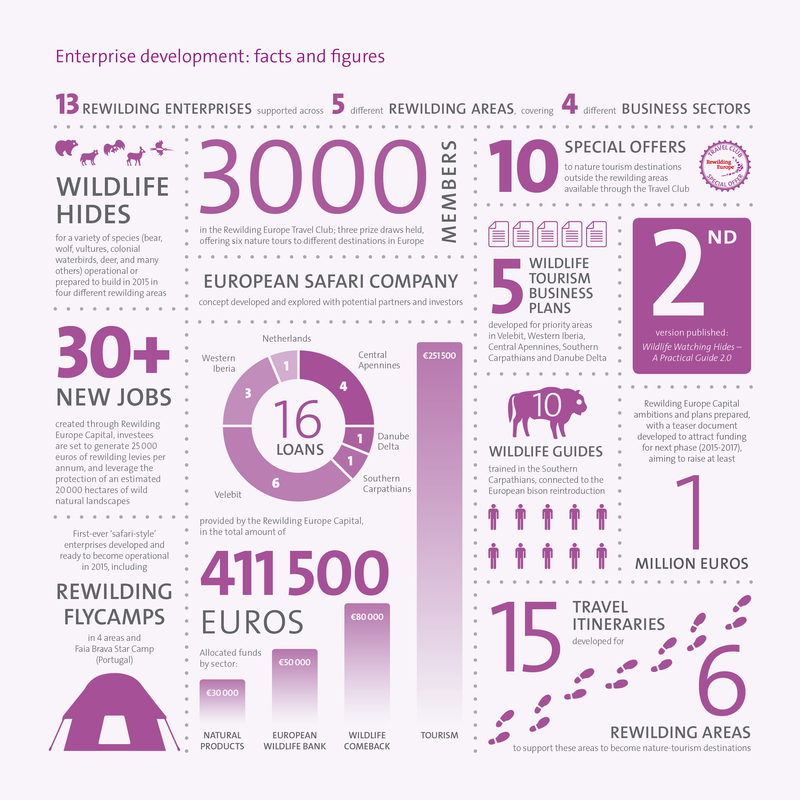 The Rewilding Europe Capital facts and figures represent a summary of rewilding enterprise development until the end of year 2014. In Europe there is virtually no consciousness around the potential for commercial enterprise actively engaging with and supporting the conservation and rewilding of natural landscapes. Despite distinct enterprise opportunities coming from significant natural values across Europe and the accelerating ‘wildlife comeback’ now occurring, Europe’s nature-based enterprise sectors remain thinly represented. In rural areas commercial value of natural capital is poorly understood and access to third party development finance for enterprises working with nature and natural landscapes, virtually non-existent. With its accessibility, security and close access to significant markets, Europe provides a suitable landscape and infrastructure for rewilding enterprises. In 2013, Rewilding Europe launched Rewilding Europe Capital (REC) to promote these opportunities and provide technical, financial and promotional assistance to businesses that can make a meaningful difference to rewilding and those relying on natural landscapes. REC is positively addressing negative socio-economic impacts caused by rural land abandonment happening in many areas in Europe by supporting rewilding in Europe and by promoting new and sustainable nature-based economic models. REC differentiates Rewilding Europe from any other conservation initiative in Europe because it aims to facilitate economic returns from nature, wildlife and rewilding of landscapes, rural cultures and heritage. REC was officially launched in October 2013 at the WILD10 ‘World Wilderness Congress’ in Spanish Salamanca as a € 500 000 worth enterprise financing facility. Since then REC has issued 16 loans totalling € 411 500 and supporting 16 local enterprises in four different countries (Portugal, Italy, Croatia and Romania) creating over 30 new jobs and setting the basis to annually generate € 25 000 of rewilding levies to directly finance rewilding activities in those areas. REC is also enhancing the rewilding of an estimated +20 000 hectares of land, most notably in Velebit, Western Iberia and the Central Apennines. Many of these loans have been the first of their kind in Europe and are pioneering the rewilding enterprise sector. Amongst many innovative business models REC provided loans to businesses working in nature tourism sector such as Linden Tree Retreat & Ranch in Velebit (Croatia), Casa da Cisterna in Western Iberia (Portugal) and Wildlife Adventures in the Central Apennines (Italy). 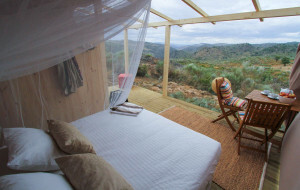 REC is also pioneering in the development of Europe’s first-ever ‘safari-style’ enterprises including the ‘Rewilding Tented Camps’ in four rewilding areas and the Faia Brava Star Camp, launched this summer in Portugal. Matthew McLuckie, Investment Manager of REC comments: “In Europe’s current economic and social landscape access to funding is challenging and there is very little ‘consciousness’ around the strategic and economic potential of commercial enterprise actively supporting nature conservation. Our team is very happy to see the success of REC funding facility and we are working hard to continue this positive momentum of creating new nature driven economic models”. 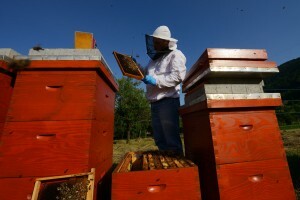 Guslice & Melnice Honey producers received a € 30 000 REC loan and pledged 2.5% of their future total gross income to directly help support rewilding activities in Velebit Mountain, Croatia. Moving forward REC is working to expand and aims to issue at least 30 new financial loans by 2018 to businesses operating within the rewilding areas. These will build upon the success already achieved by REC in creating significant impacts including new jobs, localized economic growth and annual direct cash flows directed to support rewilding, growth in local taxes paid by rewilding enterprises, and new joint venture partnerships that foster positive sentiments and activities for rewilding. For more information about REC and about the terms and criteria on how to become a rewilding enterprise, please visit the new Rewilding Europe Capital web page section.